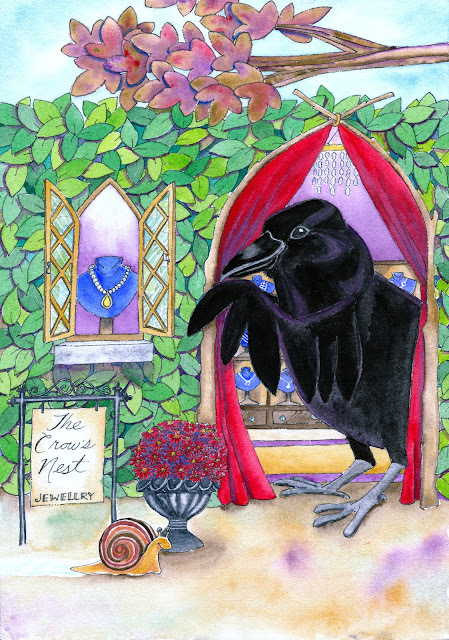 Edward is the sleek and dapper crow who owns the beautiful jewellry shop in Elderberry Hedge. Edward not only sells beautiful jewellry, he is a skilled gemologist and fine metalsmith crafting custom pieces for the discerning customer. The study and interest in gemology and fine metals has been passed down through many generations of Edward's family. Known to have an outstanding ability to spot pieces of fine metal and jewels just about anywhere, Edward has many family members working as scouts and buyers for the world's leading jewellry houses. Others have been hired over the years by wealthy patrons to guard and maintain personal jewel collections. Edward has said that a distant cousin of his still lives in the famed Tower of London, guarding the Queen's jewels﻿.